Recently the memory of my dead father has fallen from my eyes, and I'm not quite sure what to believe or not. Nonetheless, that still doesn't deter me from finding out the truth in this great adventure Created by Mark Waid, Javier Rodriguez, Chris Samnee, and Published by Marvel in August, 2014. Mummy, Matt is coming home! To QUOTE Tullian Tchividjian: 'The deepest fear we have -- the fear beneath all fears -- is the fear of not measuring up, the fear of judgment. It's this fear that creates the stress and depression of everyday life'. Matt Murdock wants to speak with his Mother Maggie so he can finally put at rest any nagging doubts he has about his father being a wife beater. 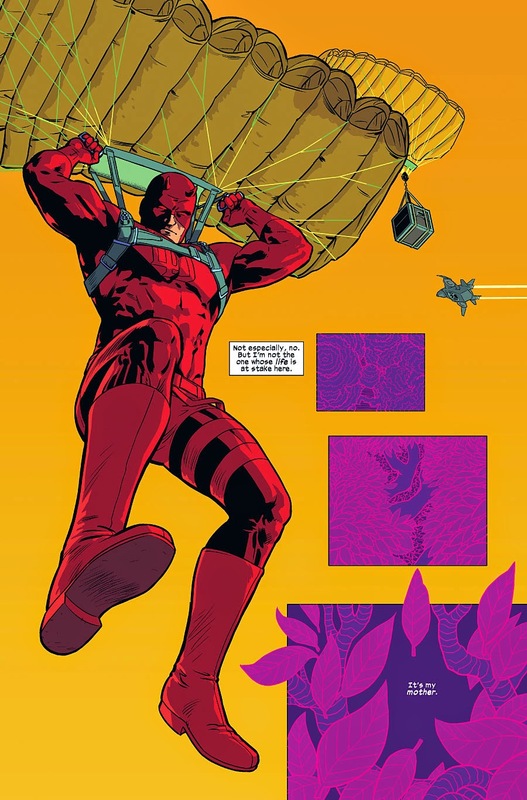 But for him to be able to do this, he has to parachute down onto Wakandan soil, and then retrieve her from the clutches of Shurl -- the Queen of this jungle nation. Can he do this though? And if he can, how does General Eaglemore fit within the scheme of things? Let's see, shall we? By checking out this amazing adventure called 'Nun to Be Found'! 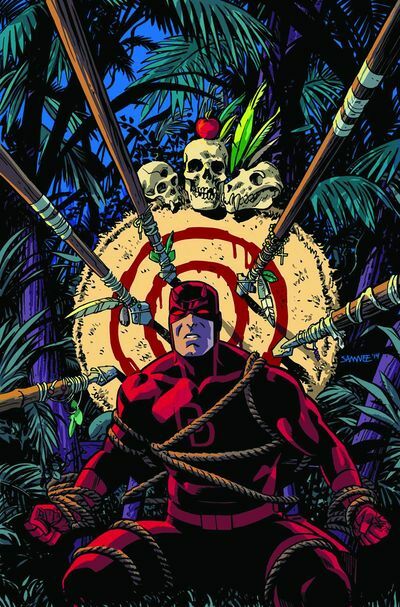 A must read for any Daredevil fan out there. Now if you moaned about what Mark and company did last issue, fear not, cause in this issue they've turned everything around, and justified to me, you, and nigh on everyone on the planet, why they're one hell of an amazing creative team to follow. Well, apart from those smashing visuals drawn by Javier Rodriguez -- good job, Jav -- as per usual Mister Waid managed to do two things that stood out from the crowd. For a start he made sure that Matt had a devious plan up his sleeve so he could outsmart Shurl and her Wakandan army. And then, during the aftermath of this event, he gave Maggie some time to explain to her son why she left him and become a nun. Honestly, dear reader. There was hardly anything about this issue I didn't like. To me those concluding scenes between Matt and his Mum were worth the price of admission on their own. And in no uncertain terms they made me feel for both their plights, as well as the plights of every other mother who has suffered from postnatal depression. Oh! Wait up! I stepped over the mark there, didn't I? I'm so sorry for giving this revelation away. I promise I won't say anymore than that. Well. Not much anyway. The only slight problem I had with this installment were those actions scene's between Matt and the Wakandan army. In my eyes they didn't have much of a kick to them, as they came across very loose and jovial upon the page. Now don't get me wrong, in places it was pretty intense. Yet for me, personally speaking, I would've liked these scenes to have a more imposing and 'in your face' attitude. Without feeling fairly -- you know -- safe and secure. On a conceptual level I'd say this funky adventure had a rather rhythmical beat to it, as well as involving a 'baby' who has the blues. Yes. That's right. I said 'Baby Blues'. Just like the following 1972 classic sung by the one and only, 'Badfinger'. Now if I push to one side those 'action components' associated with this comic book, essentially it's about a mother who once suffered and overcame postnatal depression. So with that in mind, dear reader, a part of me feels compelled to compare this tale to such celebrities as Brooke Shields or Gwyneth Paltrow, because they too overcame this said same ailment. Did you know that postnatal depression can affect women in many different ways? Honestly, my friends. Just like Maggie said in this issue, sometimes symptoms can start after giving birth, and last for months on end. Or in some extreme cases, they can persist for more than a year plus. So, just to keep you in the know, please check out this list of facts relating to this debilitating illness. Quite often the recipient will get a persistent feeling of sadness as well as a loss of interest in the world around them. It's quite common for them to have strange sleeping patterns during the day or night. Difficulty concentrating or making decisions is a usual factor they have to contend with. By in large low self-confidence is quite common for most people with this illness. In most cases poor appetite or an increase in appetite is the norm -- i.e. comfort eating. For no apparent reason whatsoever a persistent feeling of agitation can be experienced. It has been known that feelings of guilt and self-blame can attribute to suicide or even self-harm. Nuff said. Great comic. Peace out.